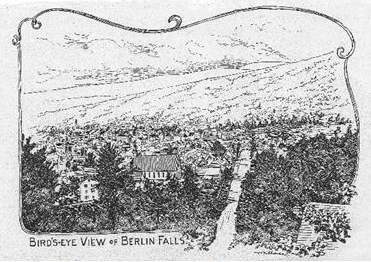 One of two villages in early Berlin, what is now Downtown Berlin was originally known as Berlin Falls. 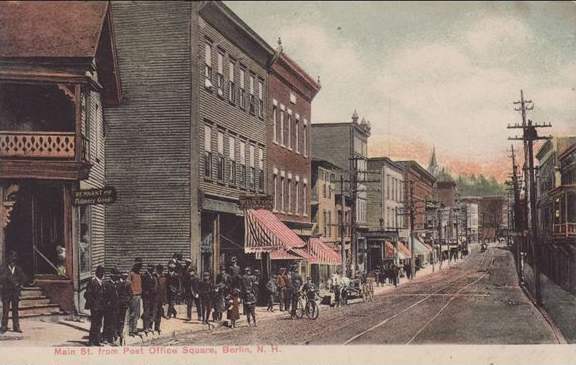 In 1888, a writer described his impression upon arriving in Berlin in 1867, “What is now Main Street, was then a very poor road through a poorer country. Nothing but mud underfoot, rain overhead, a few shabby buildings on one side, and the most uninviting collection of bushes and rocks imaginable on the other. . . 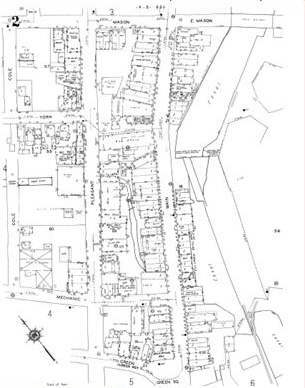 It scarcely seems possible that at that time there were only thirty-six buildings in what is now the two villages, including the stores, mills and dwellings (Berlin Independent 4/11/1888). Berlin’s population nearly doubled every 10 years between 1870 and 1900, and the town became a city both in density and government. 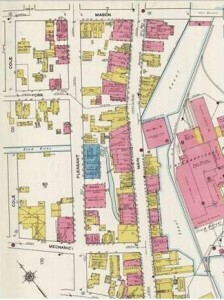 With increasing prosperity and a burgeoning population creating its own market demands, the downtown grew correspondingly. Several factors however either constrained or threaten that growth. 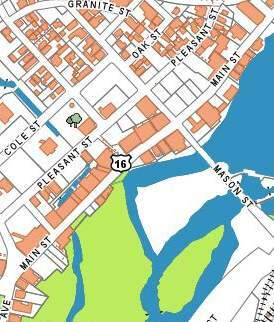 While the mill pond hampered physical expansion of the downtown westward, the threat of fire within the increasingly dense Main Street made business wary of investing too much too quickly. Eventually, aided by mutual interest of the paper-mill owners, the Androscoggin was dammed at points through the city and channelized into a canal that appreciably decreased the thread of flooding. But even when the canal waters were further contained by the 1920s into an enclosed sluiceway the threat never fully subsided. 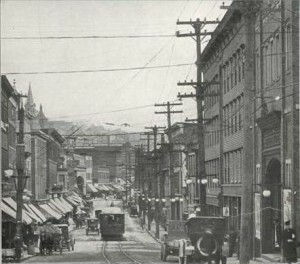 By 1910, with the population up to 11,789, Main Street had largely been transformed into a commercial avenue of three and four story brick blocks with little or no daylight between them. The street and sidewalks were still mostly dire; a single trolley track ran up the middle of Main Street connecting Berlin to Gorham downriver. My name is Réal Bisson from Quebec Canada. I am researching my family Bisson (genealogy). My great uncle Israel Bisson worked and died at work in Berlin Fall’s late December 1903 or early January 1904 .Israël Bisson was born September 8, 1880 in St-Léon-de-Standon QC. Canada. He was 23 years old when his work accident (the funeral was held January 5, 1904 in St. Leon de Standon Qc. Did you have information in your records on the circumstances of his accident. Thank you Mrs. Odette Leclerc, I received information concenant the death of Israel Bisson my great uncle’s. Hello My name is Lisa Barlow and I am researching my great-grandparents. I have spotty information but I think he lived for a while in Berlin Falls. His wife Marie Desanges Larose married to Louis Morin died giving birth on Dec 1, 1891 I think in Berlin Falls. 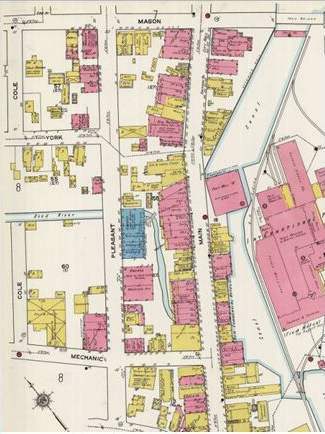 Louis brought her body back to St-Leon-de Standon, Qc, Canada and she was buried Dec 5, 1891. The story is that he brought newborn baby back to Canada. I can’t find any records. Would you possibly have any records of birth or baptism?